Most of us rejoice when the prices at the pump go down. To use that means freed-up cash in our personal economy. When we’re consider buying or selling a home, however, the price at the pump can impact our bottom line in ways we don’t realize. When the local economy relies on income from crude oil sales, a drastic reduction in prices can depress the local market. So in places like Houston or the Canadian Province of Alberta, for example, a dip in the price of crude oil could mean fewer people moving into the area so sales to newcomers may slow down. Or, it could mean that folks whose income relies on the oil industry may decide not to move into that bigger home until things stabilize. Conversely, communities that rely on delivery of good from other areas might see an improvement in their local economy. If your city relies on the trucking or train industries, lower prices on fuel can mean more money freed up to spend on housing. Economies that depend on air travel should also see an uptick since lower fuel prices means lower cost air travel. One of the historic predictors of inflation was a rise or decrease in oil prices. Economists would predict that an increase in fuel costs would depress the consumer aspect of the economy while a decrease would raise consumer spending. In this scenario, a decrease in fuel prices should result in an increase in housing prices since more people would be able to enter the house-buying market. Recent forecasts run by the Federal Reserve Bank of Cleveland question the long-term use of oil as an inflation predictor, but for current decades, the connection is striking. 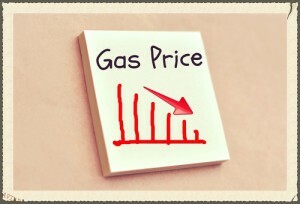 For many housing markets, a decrease in fuel costs should improve the selling market. While most consumers know how prices at the pump affect their driving habits and even some of their spending habits, most do not reflect on the way it changes the price of products made from petroleum byproducts. These products include most of the products on the shelves of discount retailers like Wal-Mart and Target. From your plastic milk jugs and water bottles to that flat-screen TV, clothing to carpeting, oil prices affect the products you use in your home every day. When prices go up, the cost of goods sold goes up. As prices of crude oil go down, however, manufacturers and retailers may not be as quick to pass those savings on to consumers. Volatility in the crude oil market means they may have to plan for the prices to go back up in the future so they may delay lowering the price of goods. An unstable market means that the cost to build new Lofts can change from day to day. Year over year, the cost to build the same home varies dramatically. According to the National Association of Home Builders, the average share of a loft’s sale price that goes to the construction cost jumped from 59 percent in 2009 to 62 percent in 2013. This means that new Lofts built during higher costs times may not see the same price reductions as older pre-owned Lofts.